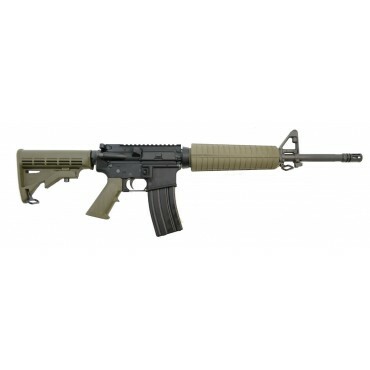 PSA has the freedom rifle on sale for $399.99 With free shipping! There a solid entry level rifle with some some stuff the lower rifles don't have. Forward assist and dust cover included. Denton, A Watchman, Back Pack Hack and 4 others like this. Well.. I have aks and have wanted an ar too. The choice this year was a 3030 lever or ar but this fits the bill for me. Great price and specs look good. "Erosion of our rights just takes a few good men doing nothing"
Start buying AR's, magazine, parts and pieces.. I dont think the prices will be low that long. Something in my spidey senses are making me think ahead on rifles, ammo etc. dwight55, jimb1972, The Resister and 2 others like this. Do some quick math and you will find this $469 one a much better deal than the $399 one. AquaHull and Denton like this. The PSA MLok rails are smooth and stiff, and the nitride coating is way better than plain phosphate in a SHTF time. That is a low price for an AR-15, and if it is any good, then it is a bargain indeed. 1. I have started reading Thucydides, The History of The Peloponnesian Wars. It looks like it will be a tough read; it is very intelligently written, and it is the kind of book that used to be required reading in college. 2. Should my health remain reasonably good, I will teach myself advanced algebra; and then test out of it at Saint Petersburg College. I will get those credits by self-study, and it is doable. Here is the problem with $399 ARs. The may well be ok AR's. But they generally have fix A2 type front sights. Standard round plastic Colt style hand guards, phosphate treated parts . As basic as you can get pistol grip. Often when I see someone new to this the weapon their heart sees is one more like the $469. Their pocket book sees the $399. Stinking thinking say I can swap out the parts latter. What happens is to get rid of A2 front sight you need a new gas block. And free float rail is not cheat and you need that for front sight in some cases. And it makes a better weapon. Not all front sights can be or should be mounted to the gas block. Some times if you shop right an AR will come with MAGPUL stock and pistol grip. Not the highest end stuff but very good. Change out the parts is not hard but will require some base tools tools for the Job. Not overly expensive but they do add to cost. Now do the math Turn the $399 AR that you check book likes into the one your heart sees. You would likely have been much better off getting one that had what you wanted all ready at a high price. I am not immune to impulse buying. But it is not common for me. I generally know where it is I am going, where I want it to end . Then I compare prices and buying components. Often if you know what you want and know what is should cost. Buying a complete upper that has what you want , then mating it to a lower you pick up on a good sale, or one you assemble from good parts comes in at a budget friendly price. This last approach is one that done right allows you take advantage of sales and assemble the AR your heart really wants. I have wanted an AR10 upper to mate with a lower sitting here. I looked at buying just the barrel, BCG, charging handle and rail it kept going over the assembled cost of the parts. This morning I checked there it was. I wanted a 20 inch barrel complete upper assembly with parts I wanted and it had Free shipping. It took all of 1 minute to hit the send key. I was not going to beat that price doing parts. Don't be fooled Not all free float rails are good ones cheap is most often Cheap. it is easy to make a standard trigger as good as many $100-$179 drop in ones or kits for about $25 requiring no special skills. Last edited by Smitty901; 01-03-2019 at 11:42 AM. And I Love it. It's a tool. The only modification is a polished trigger. I use it for what it was intended to do. It's just a shooter. I have a blast with my work horse. I spent that other $70 on Ammo. Do a search for Joe Bob bolt and the 4-6 pound springs About a $25 mod that will make the trigger out standing. The Joe Bob bolt allows you to adjust the take up travel with ease and at a budget price. It works The Springs keep the trigger safe and reliable but allow better accuracy . I put a trigger group done with the Joe Bob and springs next to and expensive trigger group and you can not really tell the difference. The Joe Bob bolt works with Ar10's also.